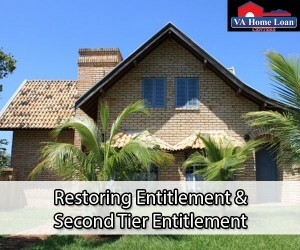 Veterans that have used their entitlement in the past, but are looking to buy another home are offered the ability to restore their entitlement. An entitlement restoration can only occur in certain circumstances. The veteran must meet current income, occupancy, and credit requirements. In order to restore a previously used entitlement, the previous VA-guaranteed loan must be paid in full. The veteran must also agree to pay the outstanding balance left on the VA loan. There are special cases, in which a past entitlement can be restored without meeting the basic criteria. A veteran may receive entitlement restoration if the past VA loan has been paid in full or if the loan will be paid off at closing. Another special case for entitlement restoration is when the veteran has paid the prior VA loan but has not disposed of the property securing the loan. In this case, they can use tier two entitlement. If your county loan limit is more than $417,000, adjust the above equation accordingly. County loan limits can be found here. The minimum loan for a second-tier entitlement must be $144,000. It is important to be sure that you have the income to afford two mortgage payments, or have a renter locked into a lease. Your eligibility can be found by contacting VA Home Loan Centers. One of the main requirements for a VA loan is that the veteran has full intention of occupying the home or condo they are getting the loan for. If someone uses a VA loan on a property, then in turn sells or arranges to sell the property to a third property without occupying it, then it is considered misuse. If it is found that a veteran is misusing their entitlement, then they will lose their VA loan. Note that circumstances, such as PCS or deployment, may cause a borrower to not occupy the home. This is not misuse. Misuse only occurs if the borrower does not intend to occupy the home upon the closing. Contact VA Home Loan Centers at 888-573-4496 to apply for a VA home loan today.